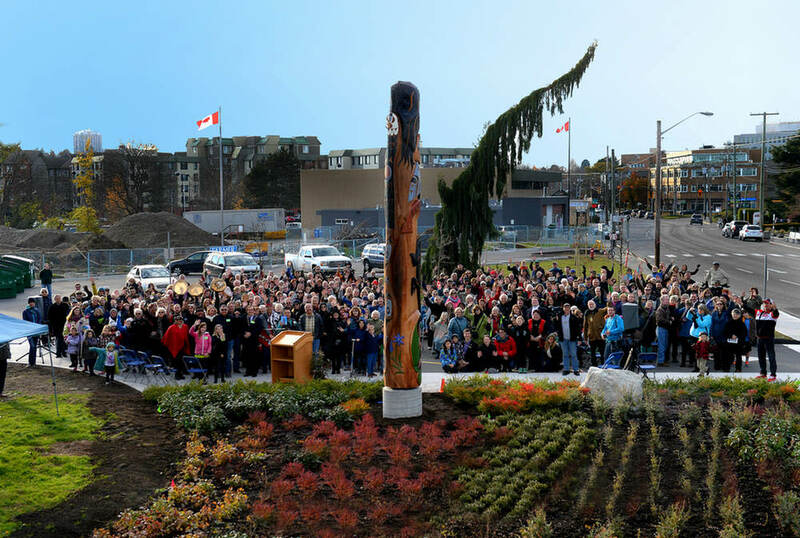 The Oak Bay Connector – Embrace the LIGHT! Embrace the Night started on Valentine’s night exactly one year ago. We grew from a modest dozen participants to as many as 70+ during the summer Super Moons. Here’s a twist to the anniversary evening on Feb. 14, 2015 – walking earlier than usual, while it is still light and prior to any dinner plans, while hoping to catch a beautiful sunset at our turn around point on Beach Drive. 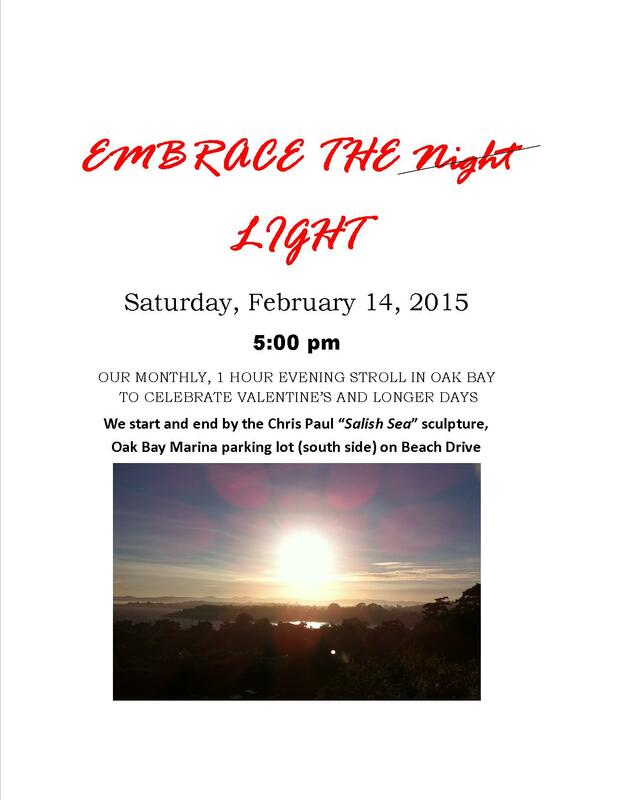 We will start our walk by the “Salish Sea” sculpture of local First Nations artist, Chris Paul, at the south end of the Oak Bay Marina parking lot off Beach Drive, at the foot of Currie Road. 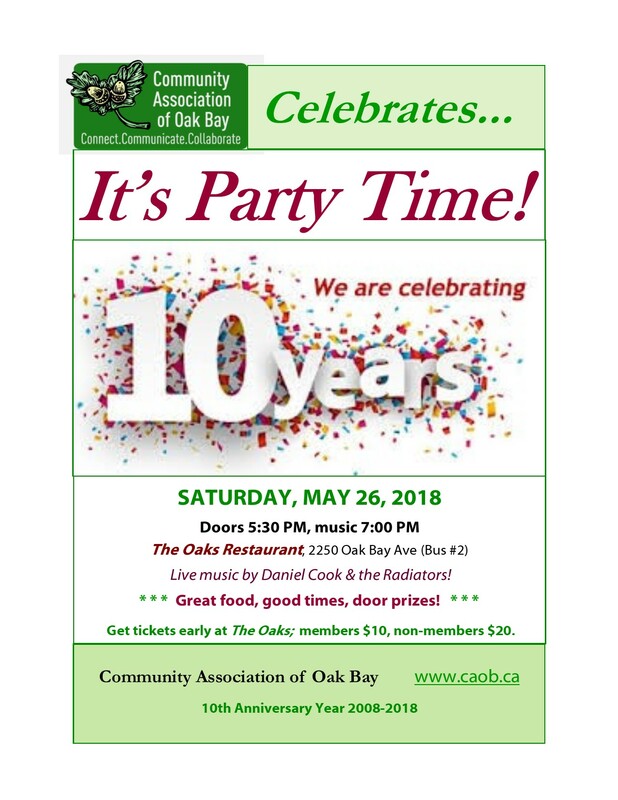 Our route will be familiar to many of you: we will head south along Beach Drive, duck into the Native Plant Garden across from the Oak Bay Beach Hotel, catching the Sunset at Shoal Bay and back to the Marina, all the while mingling and meeting new friends. South from the Marina Parking lot along Beach Drive stopping at Shoal (McNeil) Bay and then back. To walk in the waning daylight with great company, enjoy the health benefits and (fingers crossed) catch a beautiful sunset. Back to our start a little after 6:00 pm. Bring a little change so we can retire to the Marina Cafe or, perhaps, the Snug Pub in the Oak Bay Beach Hotel. We are still waiting to hear who wants us more. Note: Personal reflectors will be handed out. Please wear comfortable footwear and hope for the best but prepare for worse, weather wise. We know you’ll have fun….. Thank you, the 40+ participants who came out on this beautiful Valentine’s evening and thanks to CAOB for sponsoring and posting this event and a special thanks to our Embrace the Night/Light team for their valuable support and advice. Another successful and most enjoyable walk. 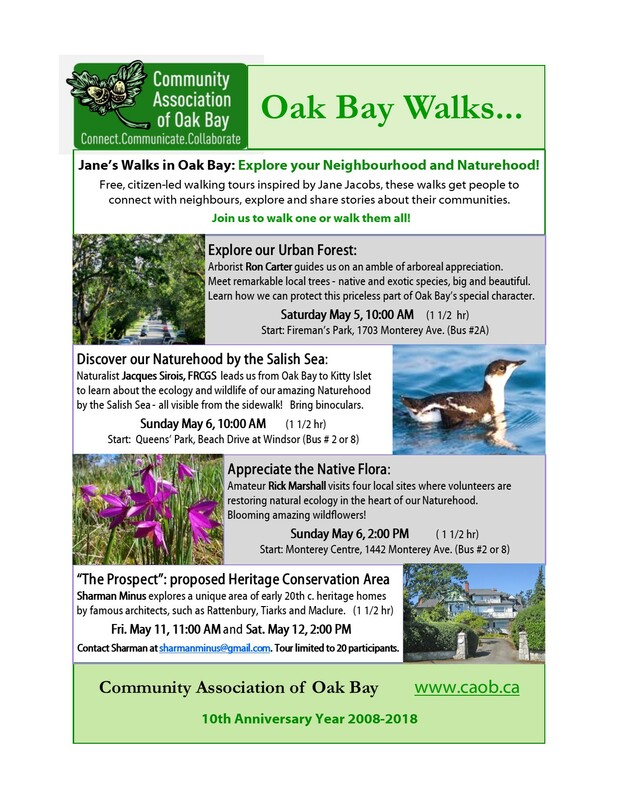 Stay tuned for upcoming months announcements and in particular, mark May 2 on your walk calendar when we will be at Cattle Point to start a tour of our priceless Uplands Park at the absolute height of the wildflower show. 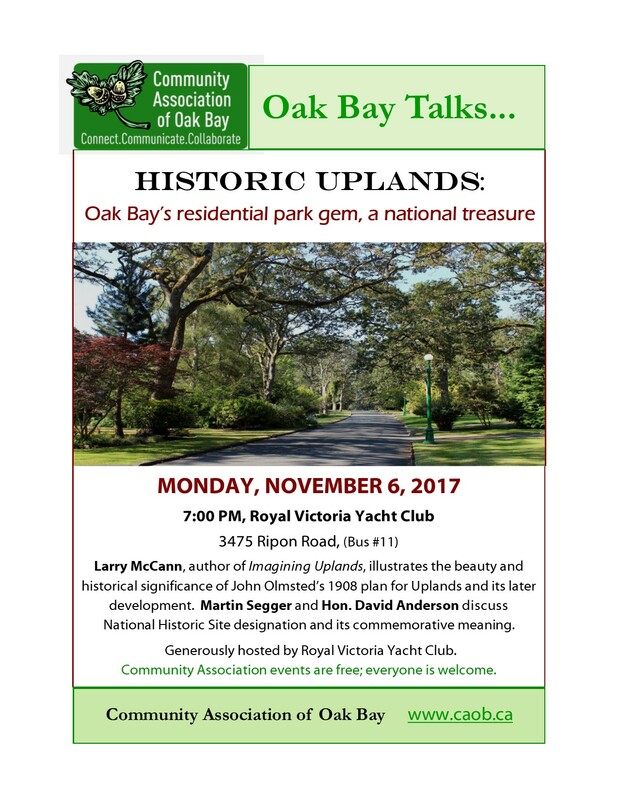 The Friends of Uplands Park founders, Margaret Lidkea and Kathleen Matthews will be on hand to expertly educate and guide you to the best spots throughout the park.